Wipe bearings down with kitchen towel to remove the excess dirt. If you want to do a quick clean, leave the shield and retainer on. For a more thorough clean, use a pin to pop the shields off. If you have the metal, fully closed bearings, then this won’t be an option. I have the Bones Reds bearings which have a shield one side and a plastic bearing retainer holding the balls on the other (most types have two shields). I pop off the retainer, but this should only be done if you feel confident as apparently there is a risk of the balls coming out, although this has never happened to me. Do this using a pin to push it off, through from the other side. 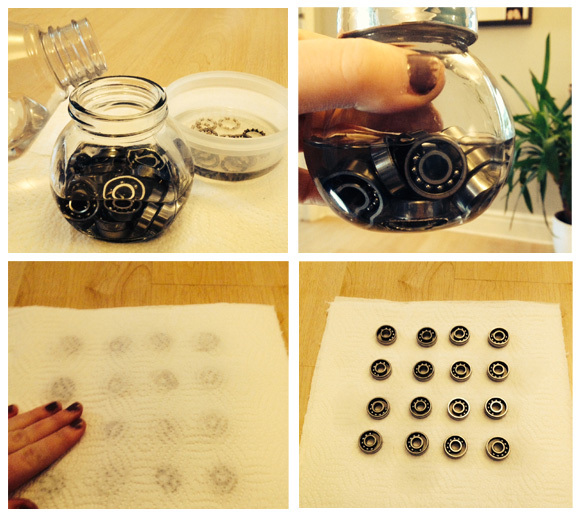 Place the bearings in a clean jam jar (or container) and fill with white spirit until it covers the bearings. If you have removed the retainers then place them in a container with white spirit as well. Shake about (not too crazy). Leave for about 10 mins. Shake again and then leave to settle. NOTE: If your bearings are really dirty you might want to repeat this with fresh white spirit until the fluid is fairly clear. If the shields are dirty then I wash them in warm water with washing-up liquid. Make sure you dry the shields straight away if they contain any metal. 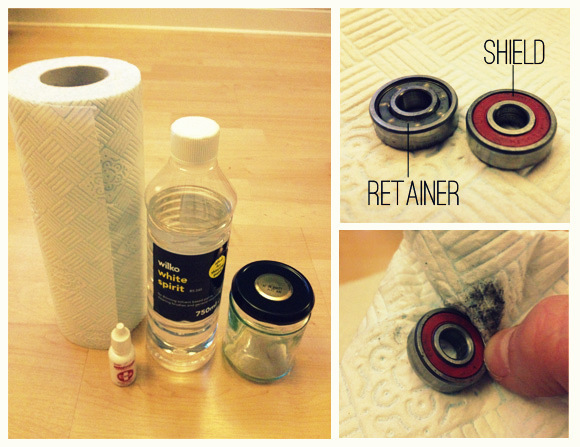 Remove bearings and place on 2 sheets of kitchen towel to dry. Dab another sheet on top to remove excess fluid. NOTE: I like to do this in the evening and leave the bearings to dry overnight. If you chose to remove the bearing retainer before, use a pin to move position the balls so they are evenly placed. Replace the bearing retainer in each bearing, making sure they line up with the balls before pushing down into place. Spin each bearing. If any feel gritty, repeat the cleaning process again. 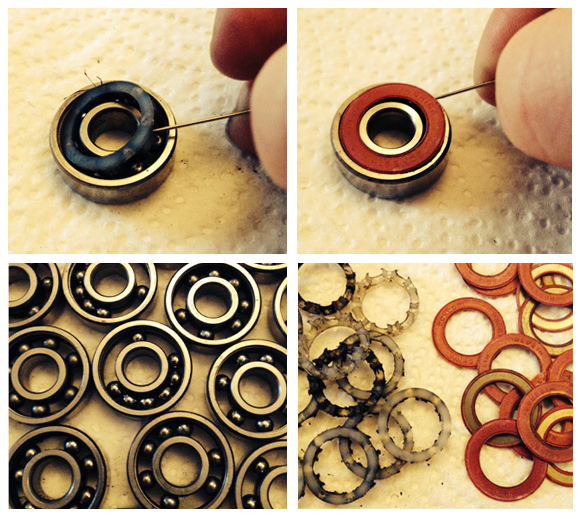 Put a couple of drops of Bones Speed Cream (or a lubricant like sewing machine oil) in each bearing and spin again. Put the bearings back in your skates (I like to use the Bones Bearing Tool). This entry was posted in Equipment, Tips by Kat Chmee (ed). Bookmark the permalink.